Windows 10 has now been available to consumers for three months, and my experience has been generally positive (despite a few minor glitches). As a Windows Insider, I've been running the latest Insider Preview builds of Microsoft's latest operating system (OS), so my experiences may differ from those who are on the standard Windows 10 update track. In the first 90 days with Windows 10, I have yet to run into any major problems. 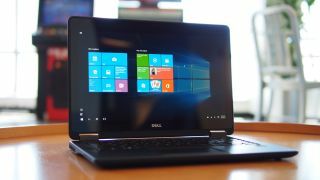 I've been mainly using the business-class Dell Latitude 12 7000 Series E7250 to evaluate Windows 10's performance, and most of the apps that I rely on daily work fine. I've also adopted Microsoft's new Surface Pro 4 slate. Chrome, Hangouts, Skype, HipChat, Adobe Creative Suite 6, Microsoft Office 2013 and VMWare Workstation 12 all run fine. Crashing issues persist three months in, and I am unsure if this is due to a compatibility issue between the OS and my hardware, or if it's more of an issue with the preview software I am running. Crashes remain my biggest gripe when using Windows 10, and the issue manifests itself in three distinct ways. As a notebook user, I never shut down my Latitude, opting for the near-instant gratification of having my laptop turn on right away when I open the lid. In doing so, I notice that through successive builds of Windows 10, prior to running the Insider Preview software, and on the more recent versions of the Insider builds, my Latitude would either slow down, become unresponsive or fail to connect to my Wi-Fi network. I am currently running Insider Preview Build 10565. When this happens, a forced shutdown by holding the power button and reboot would generally fix the issue, but the problem persists every few days. Next, the system would occasionally freeze when I was working. This issue is far less common than the previously mentioned bug, but it's still annoying. My workflow mainly consists of using Chrome, Microsoft Office and a few chat apps, so I am not sure if these apps have any impact on the crash. And finally, on earlier Insider Preview builds since the release of Windows 10, I've noticed that even though my Latitude can see and identify my Wi-Fi network, it would not connect. When this happens, the easiest fix has been to restart the system. Wi-Fi connectivity problems on Build 10565 are well documented on various sites and forums. Even though Microsoft promises near instant resume times when waking the Surface Pro 4, resuming the tablet from deep sleep has so far been problematic. On the new Surface Pro 4, I noticed that the tablet frequently stalls when resuming from sleep, and it could take more than a minute to wake up. As is often the case, my impatience got the best of me, and I found that powering down the tablet and restarting was a faster approach. The unresponsive behavior when trying to wake a system from sleep seems to affect other devices running Windows 10. One Windows Insider who installed Microsoft's OS on his MacBook called the effect on his Apple laptop the "sleeping Macbeauty." Another issue that I've continued to experience is an unresponsive Cortana. Cortana would work fine, until she decides to go on strike, which isn't a big deal in general as I don't use the digital assistant as much as Microsoft may have hoped. However, the problem is that the Cortana search box doesn't respond when I click it. Microsoft is aware of the issue, but the release notes indicate that Cortana's erratic behavior is limited to regions "where Cortana is not available," but this isn't the case with me in the US. In my workflow, I launch apps, call up settings and search for files through the Cortana search box, which is positioned next to the Windows 10 Start button on the lower left corner. This is faster than navigating through the Start menu to find what I need. Usually, a quick reboot of my Latitude would fix the problem. As I am using Windows 10 more, I am discovering shortcuts to access some of the features of the new OS. Even though Windows 10 works best with a touchscreen, you can access a few features straight from the trackpad without having to move your cursor or tap on your display. For example, I can summon Cortana with a three-finger tap on my Latitude's touchpad, and the Action Center flies in from the right side of the screen when I use a four-finger tap. These little enhancements give new life to my touchpad. Given the diversity of devices and components on the market, it's rather amazing that there haven't been more compatibility issues with getting Windows 10 onto 110 million devices to date. However, it's not all smooth sailing, and there have been a few issues with drivers in my experience. In the first month of using Windows 10, I've noticed warnings that my display driver crashed. Fortunately, that issue was seemingly resolved in subsequent builds, but not entirely. On more recent builds, I noticed that my display would black out, and then the screen would re-draw itself. It's not a full crash, and when this occurs, I don't lose any files or work, but it's just a little frightening when your laptop blacks out. The occurrence happens once every week or so, by my estimates. Additionally, I also experienced hard crashes. I recall at least three instances of seeing a blue screen of death on my Latitude, but a hard restart would clear things up. On my Surface Pro 4, I've received a few notifications in the taskbar explicitly stating that my Intel display driver crashed. The second issue I have is with printers. I use a wireless printer at work and at home, and it seems that after a reboot, my laptop has a difficult time communicating with the printer. If I remove the printer, add the printer again and reinstall the drivers, things go back to normal. But after a shutdown, the computer fails to communicate with the printer, and my print job remains in limbo. The printer problem is non-existent when I connect my printer to my Latitude with a USB cable, but a wired solution is less than ideal for the way my home office is arranged. Multitasking is really a "Snap"
I've never really used Snap before, other than to see how it works. However, as I use Windows 10 more, I am starting to appreciate Snap as a multitasking tool that keeps me focused, reduces my distractions and helps minimize desktop clutter. When I am doing research, my desktop is a jungle of multiple open apps alongside multiple Chrome browser windows each with multiple tabs. Snap keeps things a little bit more organized, and my setup is such that I have a large browser window on the left hand side of my screen, and the right side is divided by two windows, one occupying the top half and a second window on the bottom right half. For my workflow, I usually have a few different Chrome tabs open on the left half. On the right top, I have either Microsoft Word or Google Docs to capture my notes and ideas, and I reserve the bottom right half for my corporate messaging app. The built-in virtual desktop feature also helps me manage my tasks and workflow more efficiently. Generally, this first desktop is reserved for writing and researching feature stories. If I am browsing the news, I'll create a second virtual desktop to run news and social media apps. When I switched full-time to Windows 10 from Apple's OS X, the one feature I missed the most was Continuity. Continuity allows calls, messages and video chats to seamlessly integrate across my MacBook, iPhone and iPad. It also allows me to pick up reading a Safari website on my iPhone from where I stopped on my MacBook. Windows 10 will soon allow Windows 10 Mobile users to have more continuity between their devices. Microsoft is poised to launch its new messaging app that integrates SMS, Skype messages and Skype video calls across desktop, tablet and smartphone. This would allow me to respond to text messages from my phone on my desktop using a full keyboard and dismiss Skype notifications from my desktop on my phone. The feature is dependent upon Cortana, and it's unclear if iOS and Android phone owners will be able to get the same deep integration once Microsoft releases Cortana on those platforms. For Windows 10 Mobile owners, it's a nice step towards the kind of integration that Apple is rewarding users who have bought into its ecosystem. Click on to the next pages to read about our early experiences with Windows 10.